A weeklong inter-department sports competition, math Olympiad, inter-university cultural competition, IT quiz, project showcasing and exhibition were arranged. The main event included bus rally, pitha utsab, blood donation programme, discussion panels, picnic, tree plantation, games and sports, raffle draw, and musical soiree with participation of students. 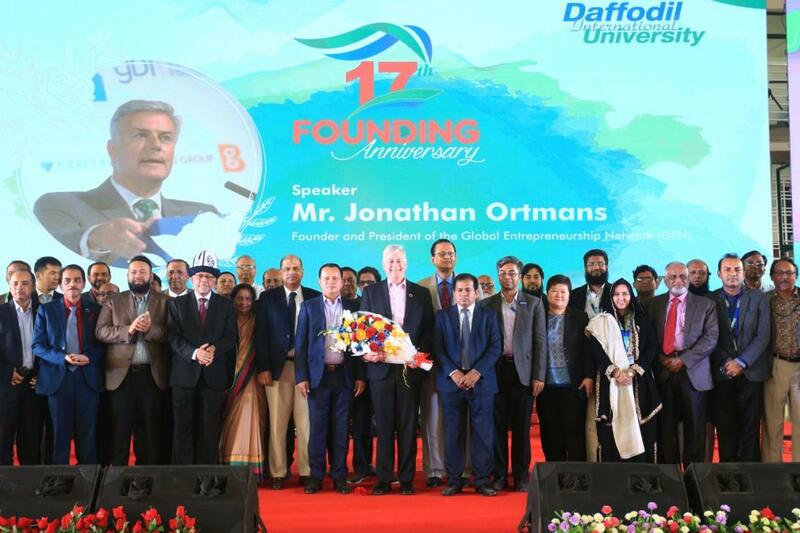 Dr Jonathan Ortmans, president of Global Entrepreneurship Network (GEN), was present as the chief guest. Dr Md Sabur Khan, chairman of DIU Board of Trustees and Daffodil Family, presided over the ceremony. The programme was addressed by Vice Chancellor Prof Dr Yousuf M Islam; pro-VC Prof SM Mahbubul Haque Majumder and Treasurer Hamidul Haque Khan, among other esteemed professors of the university. Sabur Khan said in his speech that students should develop skills during their student life, and DIU is helping them through initiatives like art of living, employability 360, and one student one laptop programmes. “DIU students wouldn’t search jobs, rather they would create jobs,” he said.